Mesa, Ariz. (Sept. 4, 2018) – Housing Trust Group (HTG), an award-winning full-service developer of multifamily residential communities, celebrated the grand opening of Aviva, a $63 million apartment community in the East Valley. 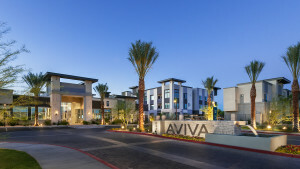 Aviva delivers eco-friendly, luxury living to the residents of Mesa. The new luxury development is over 90% percent leased, with less than 30 of its 325 total units still remaining. Monthly rents at Aviva, which offers one-, two- and three-bedroom floor plans, start at $1,121. Public officials, community members and guests gathered this evening at the property, located at 8340 E. Baseline Road in Mesa, Arizona, for an official ribbon-cutting ceremony and reception. Matthew Rieger, President and CEO of HTG thanked Maricopa County, the City of Mesa, Chasse Building Team, Biltform Architecture, Lawrence Lake Interiors, Hubbard Engineering, Gammage and Burnham, Tiffany and Bosco, Walker and Dunlop, HUD, and Mark-Taylor Residential, the property’s exclusive leasing agent, for supporting the development. Aviva’s spectacular amenities include one of the largest pools in Arizona – a resort-style, 150-foot long outdoor infinity pool with a Jacuzzi spa— surrounded by ultra-chic cabana beds, chaise lounge chairs, fire pits, and outdoor games. For outdoor entertainment, residents can socialize at the community’s Ramada which features a 120-inch video screen for all types of gatherings including game days and movie nights, a dual-sided fire place, premium outdoor kitchen grills, multiple 65” TVs, and ample cozy seating options. Other amenities include a 9,000-square-foot clubhouse which features a media and game room, custom billiards table, co-working spaces, a state-of-the-art-health and wellness center that includes smart cardio machines, free weights, boxing and a yoga/spin studio with a 24/7 virtual trainer. Additionally, the community has ten outdoor fitness stations with stationary fitness equipment, a playground with covered seating areas, a basketball court, and Aviva’s own Bark Park – a 140-foot long dog park with a covered seating area and ample room for dogs and their owners to socialize and enjoy the challenging agility course. This is multifamily developer Housing Trust Group’s first development in Arizona, with a second new development in the works. Aviva is professionally managed by Mark-Taylor Residential and has benefited from the robust network of community engagement and name awareness that Mark-Taylor-managed properties enjoy. According to leasing agent Mark-Taylor Residential, Aviva is leasing faster than any other property in the company’s 34-year history – with approximately 50 units leasing per month since January 2018. Aviva’s brand-new, green apartment homes feature open floor plans with expansive kitchens, quartz and granite countertops, stainless steel appliances, 9-foot ceilings with vaulted ceilings on upper floors, private spa-like master baths, wide-plank flooring, and private patios with storage. All units are also equipped with the highest-speed internet and cable TV available in the market. Built to the National Green Building Standard™ (NGBS), green elements at the community include dual glazed/high efficiency windows, weather-sealed insulated doors, Energy Star® – rated appliances, low-VOC paints and adhesives, low-flow faucets, drought-tolerant native plants, low-water-use landscaping, low-energy-use lighting and wide-plank “green” flooring throughout. NGBS provides practices for the design, construction, and certification of green multifamily residential buildings.